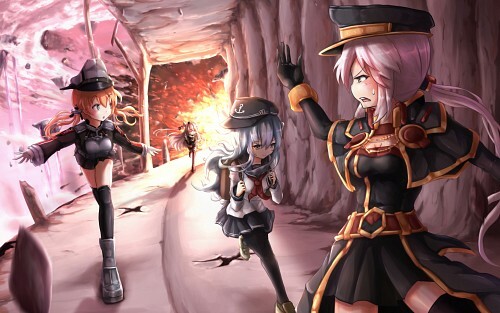 Battlecruiser, Prinz Eugen and Hibiki engaged in the exploration inside the mysterious Heptaobelisk, successfully recovering the relics, which was believed to be highly possible to be relative to the cause of massive spiritualization phenomenon. The expression of characters, the composition leading the eye and the color scheme are extremely strong here. The pink-lavender colors balances out the chaos caused by the explosion, still maintaining the cuteness of the girls! Keep your eyes open people! Wakaura may strike again without another beautifully illustrated wallpaper/indyart! Proposed by Monu-chan and highlighted by Monu-chan. i dont like their hands much, but aside from that, this is great. i like the face expressions too. btw you should sign your work. wow. i thought these we just scans at first. You're incredible, enjoying your videos.